I attach a photo showing the other side of my infilled doorway. How do I get a crack free join between board and plaster where I have removed the angle bead? Its very rough( I have only done this on this side wall the other three are still intact. Apply diluted PVA to the old plaster. If the wooden frame is properly prepared as previously discussed there will be no cracking, as long as there is no movement, and as long as you properly push the plaster in with firm pressure. The PVA will not only help the plaster stick, but will also help control the suction. Apply 2 coats to be sure. Yes treat both the same as you are joining and patching, the only difference is one is a straight edge or line and the other is not. And yes always scrim plasterboard joints. Thanks for your reply - but I am not clear about the existing old corners of plaster that are anglebeaded. Do I treat them the same way as the corner that has the angle bead removed? Plus one more thing! 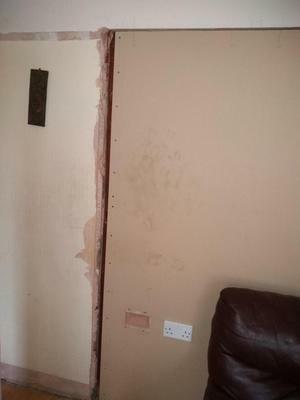 Sorry : ) The join between between the two sections of plasterboard, do i just scrim the joint and skim over?